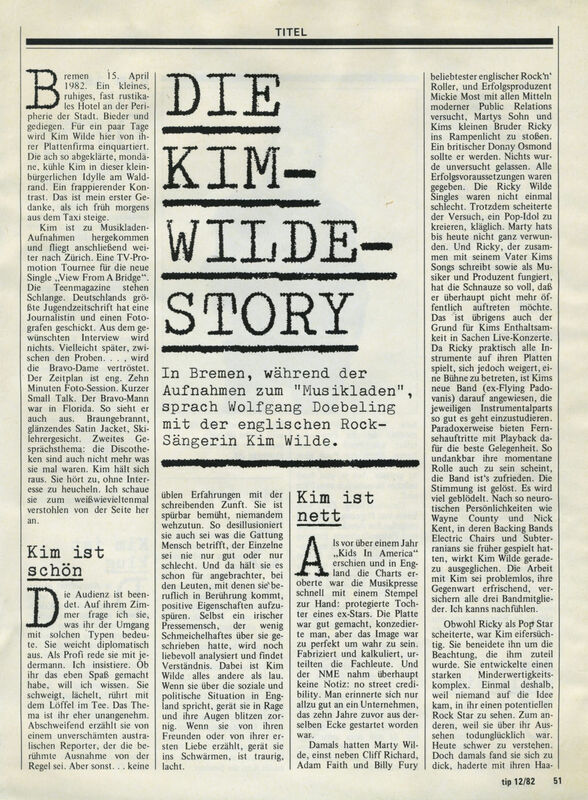 In Bremen, during the recording of "Musikladen", Wolfgang Doebeling spoke with the English rock singer Kim Wilde. Bremen April 15, 1982. A small, quiet, almost rustic hotel on the outskirts of the city. Chique and dignified. For a few days Kim Wilde is quartered here by her record company. The clever, clever Kim, in this petty bourgeois idyll on the edge of the forest. A striking contrast. This is my first thought when I get off the taxi early in the morning. Kim has come here for recording Musikladen and is then due to go on to Zurich. A TV promotion tour for the new single "View From A Bridge". The teen magazines are queuing. Germany's largest youth magazine has sent a journalist and a photographer. From the desired interview nothing will happen. Perhaps later, between the rehearsals ... the Bravo lady is consoled. The schedule is tight. Ten minutes photo session. Short small talk. The Bravo man was in Florida. This is what he looks like. Brown skin, shiny satin jacket, ski teacher face. Second discourse: the discotheques are also no longer what they were times. Kim holds out. She listens without feigning interest. I look at her for the sake of the time, stealthily from the side. The audience is finished. In her room I ask her what her dealings with such types meant. It is diplomatic. As a professional, she talks with everyone. I insist. I just want to know if it was fun. She is silent, smiles, touches the spoon in the tea. The theme is rather unpleasant. She tells the story of a shameless Australian reporter who is the famous exception to the rule. But otherwise... no bad experiences with the writing guild. She is noticeably trying not to hurt anyone. Thus it disallows as far as the species of man is concerned, that the individual is never only good or bad. And she thinks it is more appropriate to find positive characteristics among the people with whom she comes into contact. Even an Irish press, who had written little flattery about her, is still lovingly analyzed and found understanding. Kim Wilde is anything but lukewarm. When she talks about the social and political situation in England, she gets into rage and her eyes are flashing angrily. When she talks about her friends or her first love, she gets excited, sad, laughs. When more than a year ago "Kids in America" was released and the charts were conquered in England, the music press was quickly handed a stamp on the hand: a protected daughter of an ex-star. The record was well done, one conceded, but the image was too perfect to be true. The professionals judged and calculated. And the NME took no notice at all: no street credibility. One remembered all too well a company that had been launched from the same corner ten years earlier. At that time, Marty Wilde, along with Cliff Richard, Adam Faith, and Billy Fury's most popular English rock 'n' roller, and success producer Mickie Most, had tried to put Marty's son and Kim's little brother Ricky in the spotlight with all the means of modern public relations. He was to become a British Donny Osmond. Nothing was left untried. All success requirements were met. The Ricky Wilde singles were not even bad. Nevertheless, the attempt to create a pop idol failed miserably. Marty remains still not quite wounded. And Ricky, who, together with his father, writes Kim's songs and acts as a musician and producer, has had so much of it that he does not want to appear any more publicly. This is also the reason for Kim's abstinence in live concerts. Since Ricky plays virtually all the instruments on her records, but refuses to enter a stage, Kim's new band (ex-Flying Padovani) is dependent on the respective instrumental parts to do as well as possible. Paradoxically, TV shows with playback provide the best opportunity. As ungrateful as their current role seems to be, the band is satisfied. The mood is elated. There is a lot of clowning around. After such neurotic personalities as Wayne County and Nick Kent, in whose backing bands Electric Chairs and Subterranians they had played earlier, Kim Wilde is almost balanced. The work with Kim is easy, refreshing her present, assure all three band members. I can feel it. Although Ricky failed as a pop star, Kim was jealous. She envied him for the attention he was given. She developed a strong inferiority complex. Just because nobody came up with the idea of seeing a potential rock star in her. On the other hand, because she was unhappy about her appearance. Today it's difficult to understand. But back then she found herself too fat, squatting with her hair, in short: thought herself an ugly creature. I look at her unbelievably. She laughs. These are the usual teenage problems. So she wanted to sing. Successful. Throughout her schooling up to college, she was inspired by the desire to make music one day and storm the charts. Even the subsequent art studies did not disturb the dream. Father Marty was not enthusiastic. Ricky advised. A coincidence helped Kim to a breakthrough and since then she has been consciously working on her career. As I said, the judgment of the serious music press was fixed: spurious, manipulated. The fans and their teenagers remained unaffected by the misjudgment. Kim landed one hit after another: "Chequered love", "Water On Glass", "Cambodia". 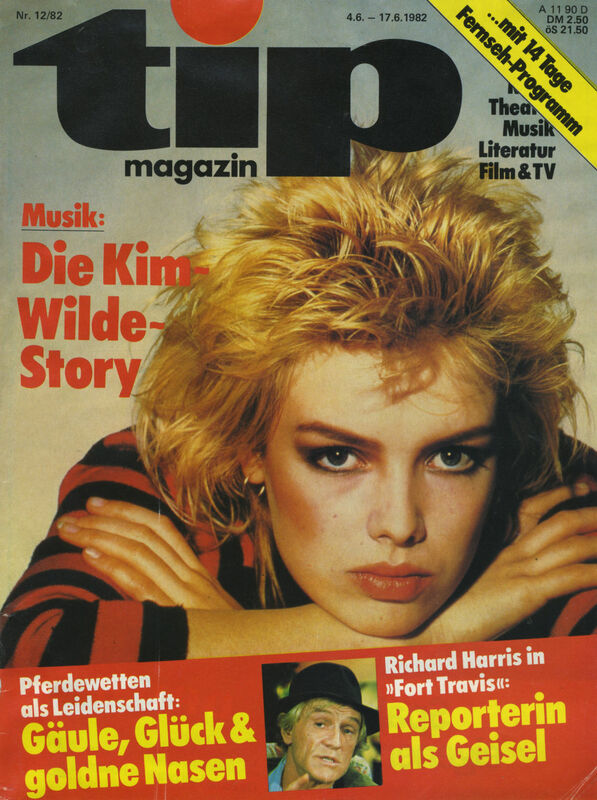 Only recently, such self-serving and important periodicals as NME, The Face, Hot Press and ZigZag by Kim Wilde began to take notice. Reports, interviews, coverstories. Where is the change of meaning? She has not changed, Kim says. It was a little suspicious. But ultimately, the interest of all the magazines is only directed to the fact that the circulation increases. At the time, it was considered fashionable, and it was probably the cause of the sudden appreciation on the part of the music business's opinion makers. Interruption. Two representatives of Popcorn have met for the purpose of interview and photo shoots. The first is promised for the evening, the latter taking place. However, not at all in the way the Popcorn people have imagined. For the construction of a complicated 3-D equipment there is not enough time, so one is content with the conventional two-dimensional illumination method. A red background is built up, Kim poses in front of it. Like all the rest of the day, she is dressed in black, only changing her clothes to go to the morning jogging. The blond mane is rubbed in a refined manner. She just stands there with the uninvolved, slightly defiant face expression, which adorns almost all Kim-merchandise. It has a charisma which can not be taught and learned. Either you have it or not. This does not escape the colleague either. A few films are shot. Then the gentlemen want more. A micro is pressed into her hand. She should pretend to sing. It's out of the question. Whether she could not bend at least a bit, hack her hair, lick her lips. Is not happening. Thumbs in the belt? The arms over your head? The legs apart? No. The manager is sought. Would she not she be able to influence Kim? No. Charming, but definitely Kim ends the session. The story that she can not smile in the public and in photos is a fairy tale. The truth is, she does not want to smile when she does not feel like it. I intersect them with their feelings at the thought that there might be war between England and Argentina. Fright and fear. Less before the Argentine military than before the British reaction. On television she has been persecuted as the royal fleet ran out, studied the faces of the soldiers. Patriotism? At the thought, she becomes bad. The worst, says Kim, is the fact that this mechanism is completely natural. Soldiers are trained, are there to kill and be killed. Just as a ballet pupil would like to be a primaballerina one day, the fulfillment of the soldier's profession is to go to war. The characteristic relationship between socially accepted masculinity and war did not permit hope for a consistent peace policy. The absurdity is that every time when human warfare is destroyed, crocodile tears are being shed. The poor guys! Has something. Without these poor guys the proper handling of a war would be considerably more difficult, almost impossible. If they are to sink one another, as long as the civilian population, the penguins and seals are not damaged. She listens to me. Does not contradict. Last night she had a dream in which Lady Di and Sirens played a supporting role. She tells, laughs, becomes thoughtful again. We talk about the most diverse things: real life, Clare, fame, money, the Stones, vacation, girlfriends, pop culture, Marilyn, Dad, Mum, Music, Sexism, Elvis Costello, George Jones, Sorrow, Joy, Handbags, Photography , Ireland, England, beauty ideals, honesty, fans, the new LP, movies, Bill Wyman, province, punk, their fascination for the world of pop music. Shortly before five, we are being towed to the car by Teddy, the EMI coach who has followed the conversation with increasing impatience. Aim: Music store studio, Radio Bremen. 17 hours 40. After hours of rehearsals and tests for lighting enthusiasts, performers and performers, the audience is allowed for the first time. Of course, there have been audiences by now: industry officials, managers, privileged press and radio broadcasters, uniformed and civilian employees from Radio Bremen. But now it is only slowly. One needs as a television-friendly staff people, who by good manners and rhythmic clapping signal good mood. Outside in the aisle they had waited an eternity to be admitted, their tickets in wet hands. The wait was several times unhappy by the fact that a star had to fight on the way to the canteen through the crowd. Body contact. Collective whim. Kim had deprived herself of the hustle and bustle, had disappeared in her wardrobe. Makeup. Move. By the way, small talk. No stage fright. Or is it seething under the surface ...? Also the main attraction of today's music store, Bill Wyman, can not be seen. He has long been in his wardrobe, while in the hallways, in the cafeteria, and in the front of the building, wild emotions are circulating about him, when and where he would arrive. So it's time. The small studio houses four stages, before which the loaded common people takes place. They still do not know on which stage which star would appear. Is probably not so important. Being there is everything. Expectant faces. A hint of event hovers over the whole. And in fact, it is something special for music-shop relations, that tonight between the usual evils are also a few candies. For many years now, director Leckebusch has, with his own selection of the performers, undeterred and with astonishing consistency the ridicule of all those music lovers who have a minimum of taste and understanding. Amanda Lear, Baccara, Luv, Pussycat - nothing was bad enough to be launched at the best time in any of the rare music transmissions. The spread of musical garbage has in the music store method. The material for his success story provides week by week the German hit parade, whose miserable state can be attributed to a not insignificant part on the imbecile sent in the music store. Sure, there are exceptions: Blondie, Carlene Carter and Dave Edmunds, Doll By Doll, Emmylou Harris - they all appeared in the music store. But almost always artists of this caliber went down in the Euro-Einheitsbrei. It's different today. Altered Images, Kim Wilde and Bill Wyman in a show! In addition, a few others easily manageable: Inner Circle, Joan Jett, Shakin 'Stevens. An exceptional music store. Possibly even reason for hope. 6 pm General rehearsal. The unspeakable Manfred Sexauer appears. I remember his programs before 15, 16, 17 years at the Saarlandischer Rundfunk. European wave Saar. "Under The Boardwalk" by the Stones was not to be pushed out of the first place of his radio charts. Was great at the time. Sexauer's great time. Today nothing is left of it. He does not run his job as a cold routine, has lost contact with the current music movement long ago. Going through the motions. No interest, no enthusiasm, no dipping. Only smooth presentation, which atmospherically perfectly matches what he usually has to offer: the numbers 1 from Italy, Belgium, Holland, Spain. Exclusively embarrassments. Sexauer looks up. "Friends" he calls the audience, under which this is thankfully not one of the clever faces of Neither Bremen-footballers. There is not much time left. The dress rehearsal, as the "friends" know, is hardly less important than the main passage. Although they were not yet on the air, every single person - whether an artist, a Cameraman or a spectator - was already doing exactly what would become serious three hours later. For the audience, this means: Appreciation made to measure, clapping after invitation, party mood. As if it were at the moment. The dress rehearsal starts. Still glimmering in one or another spectator eye a spark of enthusiasm. Some faces radiate joy. Still. The cheerfulness is skimmed off, the compulsive cheerfulness is extinguished. A few hours later there was a tormented smile, a good mood, and a mechanical clap-on to the home. No wonder. The stars are waiting for their performance. Joan Jett is lethargic and rampid. It is hardly noticed. Shaky is nervous and restless. He is strongly respected. Bill Wyman is calm and mischievous. He is treated like a god. Clare Grogan is exuberant and incredibly pretty. She is staring at me. She is 21 years old. A remarkable girl.